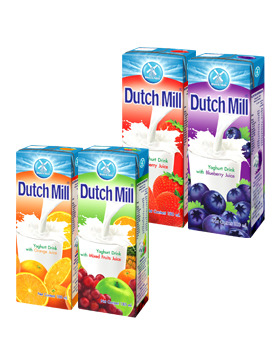 UHT Yoghurt Drink “Dutch Mill” Brand size 180ml. UHT Yoghurt Drink: “Dutch Mill Kids” size 90 ml. UHT Soy Milk with Omega "DNA 110 ml." UHT Soy Milk with Black sesame "DNA" 180 ml. UHT Soy Milk with Omega & Honey "DNA 110 ml." UHT Soy Milk with Honey "DNA 250 ml." UHT Choco Malt Drink Chocolate Flavour "DMALT 180 ml."